Love Maroon 5? Watch Their NYC Concert LIVE Tonight! Last April, in connection with those catchy commercials, American Express launched a selfie and snapshot contest to capture #EveryDayMoments. Fifty winners received an “Epic EveryDay Getaway” to NYC (and they each got to bring a friend!). The winners and their friends arrived in NYC Wednesday for days of fun. Their trip started with a swag bag that included an American Express Gift Card, DVD of Disney’s “Frozen”, Cameron Diaz’s “The Body Book”, LeSportsac cosmetic bags, Yosi Samra Shoes, RoC Multi Correxion Eye Cream, Sephora Makeup Remover, DryBar Dry Shampoo, movie tickets. Other trip highlights have included hanging out with Kathie Lee Gifford and Hoda Kotb on The Today Show, sipping cocktails with Kristen Taekman from "The Real Housewives of New York;" and watching “Rock of Ages” on Broadway. This morning they’re taking a SoulCycle spin class (with Kristen Bell! ), which will be followed by an afternoon of pampering (think blowouts by DryBar, makeup from Sephora, and styling from Rent the Runway Experts). But the piece de resistance of the getaway takes place tonight — Maroon 5 is performing exclusively for the #AmexEveryDayLIVE Concert! And the good news: You can join in the fun, even if you're not in the Big Apple. The show will be streamed LIVE, from the Bowery Ballroom, for free. This exclusive Maroon 5 concert is one way that American Express is rewarding multi-taskers, by bringing one of the hottest bands to fans tuning in at home from around the country. 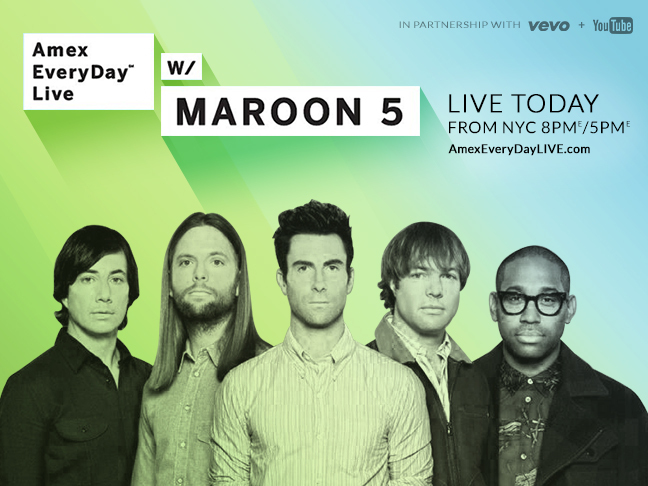 The #AmexEveryDayLIVE Concert will take place tonight, from 8 p.m. EST / 5 p.m. PST. Watch it LIVE!